There is overwhelming evidence that dietary supplementation with n-3 polyunsaturated fatty acids (PUFAs), mainly EPA (C20:5n-3) and DHA (C22:6n-3), has cardiovascular protective effects on patients with type 2 diabetes mellitus (T2DM) but not on healthy people. Because the T2DM heart increases fatty acid oxidation (FAO) to compensate for the diminished utilization of glucose, we hypothesize that T2DM hearts consume more n-3 PUFAs and, therefore, need more n-3 PUFAs. In the present study, we investigated the changes in cardiac n-3 PUFAs and peroxisomal beta-oxidation, which are responsible for the degradation of PUFAs in a high-fat diet (HFD) and low-dose streptozotocin- (STZ) induced type 2 diabetic rat model. The capillary gas chromatography results showed that all the n-3 (or omega-3) PUFAs, especially DHA (~50%) and EPA (~100%), were significantly decreased, and the n-6/n-3 ratio (~115%) was significantly increased in the hearts of diabetic rats. The activity of peroxisomal beta-oxidation, which is crucial to very-long-chain and unsaturated FA metabolism (including DHA), was significantly elevated in DM hearts. Additionally, the real-time PCR results showed that the mRNA expression of most peroxisomal beta-oxidation key enzymes were up-regulated in T2DM rat hearts, which might contribute to the reduction of n-3 (or omega-3) PUFAs. In conclusion, our results indicate that T2DM hearts consume more n-3 PUFAs, especially DHA and EPA, due to exaggerated peroxisomal beta-oxidation. Type 2 diabetes mellitus (T2DM) is associated with high cardiovascular morbidity and mortality. In patients with diabetes, the fatty acid (FA) supply to the heart increases to compensate for the diminished utilization of glucose as an energy source. Although the dramatic increase in FA influx markedly increases the fatty acid oxidation (FAO), it also leads to elevated FA and subsequent triglyceride (TG) synthesis in the diabetic heart, causing cellular lipotoxicity and the initiation of cardiac dysfunction. Alternatively, the diabetic heart is characterized by significant alterations in the fatty acid composition of heart membranes. It has been shown that the linoleic acid (C18:2n-6) content is increased and the n-3 polyunsaturated fatty acid (PUFA) content is decreased in the cardiac phospholipids of STZ-treated rats and fructose-fed rats. Fatty acids are degraded by both mitochondrial and peroxisomal β-oxidation. The fatty acids that are shorter than C20 are primarily oxidized in the mitochondria, and the fatty acids that are greater than C22 (very-long-chain fatty acids, VLCFA), including polyunsaturated fatty acids (PUFA, Polyenoic acids with 20–22 carbon atoms and 3–6 double bonds), are primarily oxidized in the peroxisomes. The fatty acid oxidation of cardiac fatty acids is controlled, in part, at the gene regulatory level[7, 8]. The nuclear receptor peroxisome proliferator-activated receptor α (PPARα), a ligand-activated transcription factor, has an important role in the transcriptional control of genes involved in cardiac fatty acid oxidation. Long-chain fatty acids and a variety of related compounds serve as PPARα ligands. Some of the genes encoding peroxisomal (acyl-CoA oxidase, ACOX) and mitochondrial (muscle isoform of carnitine palmitoyltransferase-1, mCPT-1) FAO enzymes have been identified as PPARα targets. Animal studies have shown that in the diabetic heart, some of the changes in mitochondrial function and mitochondrial FAO occur via the PPARα gene regulatory pathway[2, 11]. While previous work on the fatty acid changes and mitochondrial FAO of the heart has focused on the STZ-induced diabetic rat, it is clear that the n-3 PUFAs, especially eicosapentaenoic acid (EPA; C20:5n-3) and docosahexaenoic acid (DHA; C22:6n-3), are important for heart function. Furthermore, a higher intake of dietary long chain n-3 PUFAs has an overall beneficial effect on heart diseases[12, 13]. Recent studies have highlighted the important role of long chain n-3 PUFAs in vivo not only as a composition of biomembrane but also as PPARα ligands that cause subsequent alterations in hormonal signaling[14, 15]. According to this hypothesis, the level of EPA and DHA in the heart could provide information on the risk of heart diseases. In this study, we used a high-fat diet plus a low-dose of STZ to induce the type 2 diabetic SD rat, which is known to develop many features reported in patients with uncontrolled type 2 diabetes mellitus[16, 17], including hyperglycemia, polyuria, and loss of body weight. We examined the free long chain n-3 PUFA composition, the peroxisomal FAO activity, and the mRNA expression of genes encoding the peroxisomal FAO enzymes in the diabetic heart to evaluate the role of DHA and peroxisomal FAO in type 2 diabetic hearts. Type 2 diabetic rats were induced by the combination of a high-fat diet (HFD) and a low-dose STZ as described by Srinivasan. Male Sprague-Dawleys (SD) rats weighing 200–220 g were obtained from the Experimental Animal Center of the Hebei Medical University, Shijiazhuang, Hebei Province, China. After 1 week of acclimation, the rats were randomly divided into a control group and a challenge group, and they were fed a normal pellet diet (NPD) consisting of 10.3% fat, 24.2% protein and 65.5% carbohydrate and a HFD consisting of 59.8% fat (mainly pork), 20.1% protein and 20.1% carbohydrate. After 8 weeks of dietary manipulation, an oral glucose tolerance test (OGTT) was performed as per the literature method to confirm the insulin resistance (IR) of the challenge group rats. Diabetes was induced by a single intraperitoneal injection of streptozotocin (STZ; Alexis, USA; 25 mg/kg i.p. in a 0.1 mol/L citrate buffer, pH 4.5) given to rats with insulin resistance. The NPD rats (CON group) were given via the i.p. route in a citrate buffer vehicle. One week after STZ administration, rats with fasting blood glucose (FBG) ≥11.1 mmol/L in two consecutive analyses were considered to be the type 2 diabetic rat model (DM group). All animals remained on the assigned diet until the terminal experiment. After 8 weeks of diabetes, the FBG was performed again: CON (5.0 ± 0.4 mmol/L) and DM (12.7 ± 1.9 mmol/L). Then, the rats were anaesthetized by using 20% urethane (1.2 g/kg intraperitoneally), and plasma (8–10 ml per animal) was immediately collected from the femoral artery and processed into serum. After being washed in ice-cold saline solution, the hearts were weighed and frozen in liquid nitrogen, then stored at −80°C. All experimental procedures were performed in accordance with the guidelines established by the Ethics Review Committee for Animal Experimentation (Hebei Medical University, Shijiazhuang, China). The total free fatty acids and triglycerides in the serum and heart were measured with the commercial assay kits (Jiancheng, China) following the manufacturer’s instructions. The lipids were extracted from the serum and heart according to a modification of the literature procedures in methanol-dichloromethane (3:1, vol/vol). The supernatant was vortex-mixed with natrii sulfas exsiccatus (as a dehydrant). The dehydrated supernatant was obtained by centrifugation, and it was transferred into a screw-capped glass tube for further fatty acid methylation. Fatty acid methyl esters were prepared by procedures similar to the literature method using an acetyl chloride/methanol reagent. Then, the fatty acid methyl esters solved in normal heptane were separated by capillary GLC (Agilent 7890A) using a 30 m × 0.53 mm × 1.00 μm polyethylene glycol column (DB-WAX, Agilent). Split injection (10:1) and flame-ionization detection (FID) were achieved at 300°C. The initial oven temperature programming was 150°C isothermal for 1 min, increased to 190°C at 10°C/min, held isothermal for 58 min at this temperature, then increased to 230°C at 20°C/min and held isothermal for 15 min at 230°C with a Nitrogen gas flow rate of 80 cm/s as the carrier gas. Fatty acids were identified by comparison with standard mixtures of fatty acid methyl esters (Fatty Acid methyl esters are listed in Table1; Sigma, USA), and the results were calculated by using the respective standard curve and expressed as μg/g tissue or μg/ml serum. Data represent the means ± SD. * P < 0.05 vs. CON; ** P < 0.01 vs. CON. ND: not detected. Rat heart homogenates (10% w/v) were prepared in a medium containing 0.25-M sucrose, 1-mM EDTANa3, and 3-mM Tris–HCl buffer at a pH of 7.0. The homogenates were centrifuged for 5 min at 1000 g. The resulting supernatants were used for the following activity assays. Both mitochondrial and peroxisomal β-oxidation pathway contains the reaction of NAD+ to NADH + H+. Therefore, the total activity of mitochondrial and peroxisomal β-oxidation was routinely assayed by the palmitoyl-CoA-dependent NAD+ reduction method. The assay mixture contained a 30 mM potassium phosphate buffer at pH 8.2, 0.5-mM NAD, 0.2-mM CoA, 1-mM dithiothreitol, 0.15 mg/ml of bovine serum albumin, 0.01% Triton X-100, and, at most, 500 μg of protein/ml of assay. The temperature was maintained at 37°C. The reaction was initiated by the addition of 50-μM palmitoyl-CoA. NAD reduction was followed spectrophotometrically at 340 nm. The heart homogenates were prepared exactly the same as the total activity of fatty acid β-oxidation detection. Only the peroxisomal β-oxidation pathway contains the reaction of H2O2 production and H2O2 content can be detected exactly by luminometric reaction. The luminometric assay for peroxisomal β-oxidation detection was performed according to Osmundsen. Briefly, an assay mixture was used that contained 0.1-M potassium phosphate, 20-μM luminol, 4-mM NaN3, 10 μg of horseradish peroxidase/ml, 0.5 mg of defatted bovine serum albumin/ml, 25-μM palmitoyl-CoA, 100-μM NAD and 5-mM EDTANa3, at pH 8.5. The reaction was initiated by the addition of 10 μl of heart homogenates. The temperature was maintained at 25°C. After 10 min, the mixture was immediately transferred to a sample chamber of multifunction chemiluminescence detector IFFS-A. Then, the luminol mixture was injected, and the relative luminous intensity at its peak height was recorded. Then, the H2O2 amount was calculated by using a standard H2O2 curve. Finally, the activity of peroxisomal β-oxidation (mU/mg) was calculated by using the following formula: 1000 × H2O2 (μM)/[reaction time (min) × protein concentration (mg/L)]. The total RNA was extracted from the heart using the PROMEGA SV Total RNAs Isolation System (PROMEGA Inc., CA, USA). Both the synthesis of complementary DNA (cDNA) from 2000 ng of total RNA and the subsequent PCR amplification was carried out by the SYBR PrimeScript RT PCR kit (Takara, Tokyo). The amplification and detection were performed with a Rotor Gene real-time detection system 6.1 (QIAGEN, Valencia, CA, USA). Gene-specific primers used in the present study (Table2) were designed using the sequences accessible in the NCBI Reference Sequence and the software Primer Premier 5.0. To demonstrate the specificity of the PCR product, a melting curve analysis was performed after PCR, and each curve was confirmed to be a single peak (data not shown). The thermal cycling program was as follows: 30 s denaturation step at 95°C followed by 50 cycles of 5 s denaturation at 95°C, 20 s annealing at 60°C, and 20 s extension at 72°C. Results were expressed as the mean ± SD. The difference was analyzed by Student’s t test. Correlation was determined with the spearman correlation test (SPSS 13.0). P < 0.05 was considered statistically significant. Data were expressed as the mean ± SD. In the case of quantitative real-time PCR data, Ct values of the test genes were normalized by the average Ct values of 18S rRNA for each pooled sample. Fold changes were obtained using 2 (−ΔΔCt), and standard deviations of fold changes were determined according to the literature procedures. At the end of the experiment, serum and cardiac total free fatty acids (FFA) and triglycerides (TG) were measured in the rats of the two groups. As shown in Table3, serum FFA levels were 1.69-fold higher (1.56 ± 0.08 μmol/ml, p < 0.01) in the DM rats than in the CON rats (0.58 ± 0.11 μmol/ml), and serum TG levels were nearly 4-fold higher (18.18 ± 4.12 μmol/ml, p < 0.01) in the DM rats than in the CON rats (3.75 ± 1.68 μmol/ml). In comparison with CON (0.29 ± 0.05 and 0.75 ± 0.14 μmol/g prot for FFA levels and TG levels, respectively), the DM rats increased cardiac FFA levels by 0.69-fold (0.49 ± 0.11 μmol/g prot, P < 0.01) and TG levels by 1.45-fold (1.84 ± 0.42 μmol/g prot, P < 0.01). Data represent the means ± SD. * P < 0.01 vs. CON. FFA: free fatty acid; TG: triacylglycerol. To further investigate the changes of different fatty acids in diabetic serum and hearts, we observed 14 different types of FFA by capillary gas chromatography assay (Table1). In serum, 6 of 14 FAs including SFAs, including C16:0 (~40%), C18:0 (~65%), C20:0 (~31%) and C22:0 (~60%), MUFAs, including C18:1n-9 (~211%), and PUFAs, including C22:4n-6 (~614%), were significantly increased in the DM group compared with the control group. Only the LNA (C18:3n-3) and EPA (C20:5n-3) were 62% and 19% lower, respectively, in DM serum than in CON serum. Additionally, there was no significant change in n-6/n-3 ratio between the two groups. In the heart, 4 of 14 FAs, including SFAs, including C18:0 (~29%), MUFAs, including C18:1n-9 (~132%), and PUFAs, including C18:2n-6 (~17%) and C22:4n-6 (~157%), were significantly increased in the DM group compared with the control group. Although the total FFA of the DM heart was significantly increased, 5 of 14 FAs were significantly decreased. C24:0 was 29% lower in the DM heart than in the CON heart. Most importantly, we found that all the n-3 series PUFAs, including LNA (~45%), EPA (~100%), DPA (~42%) and DHA (~48%), were dramatically decreased in the DM hearts compared to the CON hearts. Moreover, accompanied with a slight increase in the sum of n-6 PUFAs (~11%), the dramatic decrease in sum of n-3 PUFAs made the n–6/n-3 ratio ~115% higher in the DM hearts than in the CON hearts. Fatty acids are degraded by β-oxidation. We first analyzed the total β-oxidation (including mitochondrial and peroxisomal β-oxidation) activities in the heart. As shown in Figure1A, the total fatty acid β-oxidation activities of DM hearts (3.02 ± 0.61 mU/mg prot, P < 0.01) increased by 76% compared with CON hearts (1.71 ± 0.33 mU/mg prot). We further determined the cardiac peroxisomal β-oxidation activity by a luminometric assay. As shown in Figure1B, the peroxisomal β-oxidation activity in the DM hearts was increased by ~30% (39.2 ± 5.5 mU/mg prot, P < 0.01) compared to the CON hearts (30.1 ± 3.6 mU/mg prot). 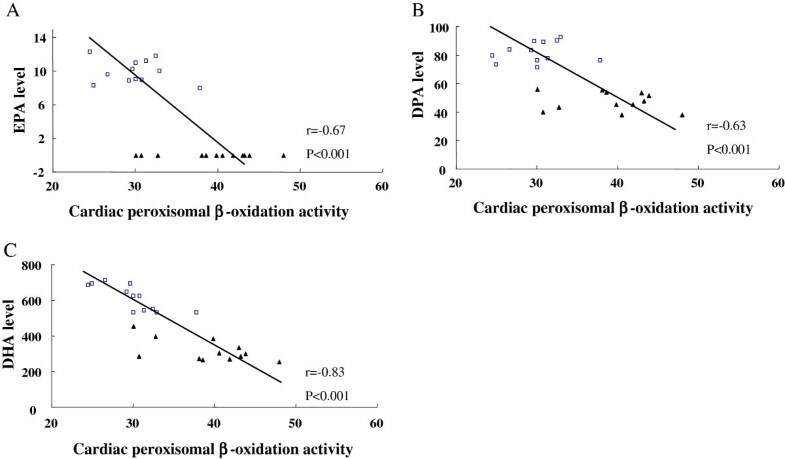 Comparison of the total activity of fatty acids β-oxidation (A) and the activity of peroxisomal β-oxidation (B) in CON and DM rat hearts (n = 12). Values are means ± S.E.M. **P < 0.01 vs. CON. After determining the cardiac fatty acid profile result, we analyzed the relationship of EPA, DPA and DHA content with the peroxisomal β-oxidation activity in heart. A correlation analysis showed that there were negative correlations between the abundance of EPA (r = −0.67, P < 0.001), DPA (r = −0.63, P < 0.001) and DHA (r = −0.83, P < 0.001) and the activity of peroxisomal β-oxidation in rat hearts (Figure2). Thus, the decreased EPA, DPA and DHA in the DM hearts were thought to be largely attributable to elevated peroxisomal β-oxidation activity. Significant correlation of peroxisomal β-oxidation activity and EPA (A), DPA (B) and DHA (C) levels in rat hearts (□, CON; ▲, DM). In this study, we obtained the mRNA expression of peroxisome proliferator-activated receptor α (PPARα), muscle carnitine palmitoyltransferase 1 (mCPT-1) and peroxisomal β-oxidation enzyme genes, including acyl-CoA oxidase 1 (ACOX1), acyl-CoA oxidase 3 (ACOX3), D-bifunctional protein (DBP), L-bifunctional protein (LBP), 3-Ketoacyl-CoA thiolase A/B (THLA/B) and sterol carrier protein x (SCPx), in the heart using real-time RT-PCR (corrected by 18S rRNA). PPARα is a critical transcriptional regulator of cardiac lipid and energy metabolism. As shown in Figure3, the mRNA expression of cardiac PPARα was not changed between the DM and CON group. The mCPT-1 is a key enzyme in mitochondrial β-oxidation in the heart, and the relative expressions of mCPT-1 mRNA in the DM group was higher (P < 0.01) than in the CON group. It indicated that the FA utilization of mitochondria was elevated in the diabetic heart. In peroxisomal pathways of β-oxidation, enzymes of catalytic dehydrogenation are ACOX1 and ACOX3; enzymes of catalytic imbitition and redehydrogenation are LBP and DBP; enzymes of catalytic thioclastic reaction are THLA/B and SCPx. And the expression at the mRNA levels of almost all of the peroxisomal β-oxidation enzymes, except LBP, were significantly enhanced (P < 0.01) in the DM group compared to the CON group. Therefore, the increased peroxisomal β-oxidation activity was caused at least in part by the enhanced mRNA levels of peroxisomal β-oxidation enzymes in the DM heart. Change in mRNA expression of PPARα, mCPT-1 and peroxisomal enzymes in CON and DM rat hearts (n = 12 in each group). Values are means ± S.E.M. *P < 0.01 vs. CON. In the heart, FAs contribute approximately 70% of the ATP necessary for normal heart function. During diabetes, there is an increased FA supply to the diabetic heart to compensate for the diminished contribution of glucose as an energy source due to insulin deficiency. Because of the dramatic increase in FA influx compared to FA oxidation, FA and TG accumulation occurs in the heart[3, 23], leading to lipotoxicity. Consistent with these reports, we found that although the activity of total and peroxisomal fatty acid β-oxidation was increased, the accumulation of TG and total free fatty acid in the diabetic heart occurred in tandem with increases in serum TG and total free fatty acid. Mitochondrial β-oxidation constitutes the major process by which most of the short- (<C8 ), medium- (<C14 ), and long-chain (<C22 ) saturated and unsaturated fatty acids are oxidized to generate energy. In the diabetic status, we found a slight increase in the fatty acids of C16:0, C18:0, C20:0, and C22:0 (0.39-fold, 0.65-fold, 0.31-fold, and 0.59-fold, respectively) and a significant increase in the fatty acids of C18:1n-9 and C22:4n-6 (2-fold and 6-fold, respectively). We also found decreases in the fatty acids of C18:2n-6 and C18:3n-3 (0.13-fold and 0.62-fold, respectively) in the serum with an increase in the fatty acids of C18:0, C18:1n-9, and C22:4n-6, (0.29-fold, 1.3-fold, and 1.5-fold, respectively) and a decrease in the fatty acids of C18:3n-3 (0.45-fold) in the heart. Considered together with the increase in total fatty acid oxidation activity and mRNA levels of the mCPT-1 gene, which encodes the rate-limiting enzyme in mitochondrial β-oxidation, it suggests that the type 2 diabetic heart removed more fatty acids from circulation to provide energy though mitochondrial β-oxidation; this supports the common view that in diabetes, the FA supply is in excesses, causing the increased cellular oxidative capacity, intracellular TG and FFA accumulation, which is associated with lipotoxicity. It was reported that in STZ-induced insulin deficiency, because of the decrease in 6-desaturase activity, the key enzyme in the conversion of linoleic acid to long-chain PUFA, the increase in linoleic acid (C18:2n-6) was observed in both cardiac and mitochondrial phospholipids. Because the serum C18:2n-6 was decreased and the cardiac mitochondrial β-oxidation was increased in our results, the increase of cardiac C18:2n-6 may also be due to the decrease of 6-desaturase activity. Peroxisomes are the major sites of degradation of very long-chain saturated fatty acids and polyunsaturated fatty acids by the sequential action of ACOX1 or ACOX3, DBP or LBP, and THLA/B or SCPx. In the present type 2 diabetic hearts, in addition to mitochondrial oxidation, peroxisomal β-oxidation was also observed to be enhanced; this was indicated by increases in activity and mRNA levels of genes involved in the peroxisomal pathway, together with the decrease in lignoceric acid (C24:0) levels that were β-oxidized only by the peroxisomal pathway. Regarding PUFA, peroxisomal β-oxidation takes a dual function: synthesis and degradation[27, 28]. Although peroxisomal β-oxidation participates in the synthesis of DHA in some organs, such as the liver and brain, it has been reported that the rat heart cannot synthesize DHA from circulating ALA because it lacks elongase-2. Thus, the content of PUFA in the heart depends on the transportation to the heart from circulation and degradation in the heart. In our study, the content of EPA, DPA and DHA were significantly decreased in the DM heart, but changes were slight in diabetic serum compared with CON serum. Moreover, the activity of peroxisomal β-oxidation in the diabetic heart correlated negatively with the content of EPA, DPA and DHA. Therefore, the decrease in cardiac long chain PUFAs, including EPA, DPA and DHA, might be related to the elevated peroxisomal β-oxidation activity observed in this study. It is worth noting that all the observed n-3 PUFAs were significantly decreased in the type 2 diabetic hearts. Moreover, because of the significant decrease in n-3 PUFAs and the slight increase in n-6 PUFAs, the n-6/n-3 ratio was doubled in the diabetic heart. During the past 3 decades, thousands of epidemiologic, observational, experimental, and randomized controlled studies have been published regarding the cardiovascular protective effects of n-3 PUFAs, especially DHA and EPA. For example, DHA and EPA can ultimately increase arrhythmic thresholds, increase the threshold of ventricular fibrillation, increase heart rate variability, reduce ischemic damage, and favorably affect autonomic tone[30–32]. Furthermore, several authors tended to explain the PUFAs effects in terms of a balance between n-6 and n-3 FAs, rather than the absolute amount of each single molecule. In the most simplistic interpretation, a very high n-6/n-3 ratio is considered detrimental for human health. These data, therefore, showed that the reduction of the n-3 PUFA content (mainly EPA, DPA and DHA) and a high n-6/n-3 ratio might be another factor associated with type 2 diabetic hearts in addition to the accumulation of the ectopic free fatty acids and TG. This may also explain why a higher intake of dietary long chain n-3 PUFA, especially EPA and DHA, is required for heart diseases in type 2 diabetes. In some studies, the activation of PPARα and subsequent enhanced expression of the PPARα target gene, which increases fatty acid oxidation, were observed during insulin resistance and diabetes[33, 34]. In our results, although the mRNA expression of PPARα had no changes, the enhanced mRNA expressions of ACOX1, 3 and mCPT-1 (PPARα targets) represented the activation of PPARα in the type 2 diabetic rat heart. In conclusion, we found that, except for the increasing mitochondrial β-oxidation, the activity of peroxisomal β-oxidation was also significantly increased in type 2 diabetic rat hearts. The increasing activity was, at least partly, due to the elevated expression of genes involved in peroxisomal β-oxidation, especially ACOX1 and 3 (PPARα targets). The enhanced peroxisomal β-oxidation and reduced n-3 PUFA content might be another adverse factor associated with type 2 diabetic hearts. This work was supported by the Natural Science Foundation of Hebei Province, China (C2008001036). LGH was the principal investigator, involved in designing the study, performing the quantitative real-time PCR assays and writing the manuscript. KQL carried out and analyzed capillary gas chromatography assays. MY and YS helped to perform statistical analyses and write parts of the manuscript. XL, LJF and TBH participated in experiments in vivo and performed the fatty acid beta-oxidation activity assays. LLJ designed and supervised the study as well as helped to draft the manuscript. All authors read and approved the final manuscript.